"So I'm the Darking's prisoner?" Ivan's expression was unreadable. "Pray you never find out." "What shouldn't I be afraid of you?" I asked. "You're the Darkling. I'm not saying you would throw me in a ditch or ship me off to Tsibeya, but you certainly could. You can cut people in half. I think it's fair to be a little intimidated." He studied me for a long moment, and I wished fervently that I'd kept my mouth shut. But then that half smile flickered across his face. "You may have a point." "I've been waiting for you for a long time, Alina," he said. "You and are going to change the world." I laughed nervously. "I'm not the world-changing type." "Just wait," he said softly. He swallowed, and I could see him struggle with the knowledge, but all he said was, "All right." I let out a sound that was half laugh, half sob. "Only you could contemplate imminent death and just say 'all right.'" He smiled at me and pushed the hair back from my tear-stained face. "How about 'oh no'?" Normally, I'm not much of a high fantasy gal. I love the fantasy genre, but something about high fantasy has always turned me off. Too much of a good thing, maybe? However, after hearing all my blogger friends rave about Shadow and Bone, and loving the synopsis, I knew I had to give it a chance. And I'm so glad that I did. We are thrust into an entire new world - which I am sometimes a fan of - and Leigh did not disappoint in her world building. 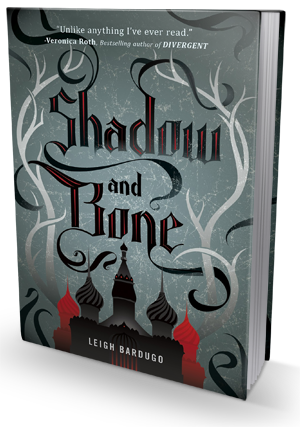 Taking place in pseudo-Russia, Shadow and Bone tells the story of Alina, a woman who transforms from a simple map maker to one of the most powerful Grisha encountered. One a suicide mission to cross The Fold (a place devoid of light and filled with monsters that a past Darkling created some hundreds of years ago), Alina's hidden powers come to light (ha!) as she attempts to save Mal from a volca and it is revealed that she is the Sun Summoner. At this point, Alina is brought to the Little Palace for Grisha training to strengthen her power in effort to help the current Darkling destroy The Fold. I'm very much about all the characters we encounter, especially our main three: Alina, Mal, and the Darkling. Alina's character does a complete 180 within the novel. She starts as this meek map maker who is in love with her childhood friend Mal to a strong and courageous woman who fights for what is right. She is broken from all angles, and one point in the novel she loses all hope, but every time she picks herself up and comes back much stronger than she ever imagined she would be. By the end of the novel, you wouldn't even recognize her as the Alina we first met. Even the minor characters stick out in my head, though one in particular more than the others. Genya befriends Alina when she first comes to the Little Palace. There is definitely more to her story than she is sharing with Alina and this creates the perfect amount of mystery that makes me want to read The Tailor - if I could freaking figure out where to buy it! There is a love-triangle, but there isn't. I can't really go into detail about what that specially entails without giving away a spoiler; however, I am fully behind this not love-triangle love-triangle. There is a weird combination of a lot happening, but not a lot happening either. Even when the plot is moving along slowly, it isn't. Things are happening. Information is being found out. Characters are progressing. Relationships are being formed. Relationships are ending. I flew through the last half because I just had to know what was going to happen! I mean, I kind of had an idea since I know Siege and Storm exists and Ruin and Rising is in the works, but I had to know. Ya know? However, when I got to the ending ("After" to be specific), I felt kind of . . . empty. Like, "that's it? I know there are two more books, but that's it?" It's something to note that I absolutely love the way she wrote "Before" and "After." I love that Leigh brings things full circle to how Alina and Mal have changed from being orphans to who they are now. I also think it it super adorable that she refers to them as "the boy" and "the girl." Leigh created an amazing world, filled with vivid descriptions and beautiful writing. I want to know more about this world and these characters. I feel like she has only skimmed the surface of what is going to happen, but in a good "I need more!" way.There are so many questions that I need to answer to and I'm torn. Do I start Siege and Storm now (because I need to know!) or would the wiser course of action be to wait until we're a tad closer to Ruin and Rising's June 3 release date so as not to torture myself? Decisions!